Hardwood floors continue to be one of the most sought after flooring products by consumers. Suppliers are meeting the demand with on trend product at the winter markets — gray/beige tones; deep, chocolate browns; and, wide width planks, just to name a few. Shaw Floors has introduced two new solid pine hardwood collections from Anderson Floors: Elements and French Quarter. Warm and rich color tones, mixed widths and a unique texture make Elements a stand-out product, according to the company. Subtle scraping and wire-brushing gently highlight the texture of this solid pine flooring. Offering a mix of 3 1/8 inch and 5 1/8 inch widths, Elements’ color line includes a rich red, warm golden tone and deep aged brown. 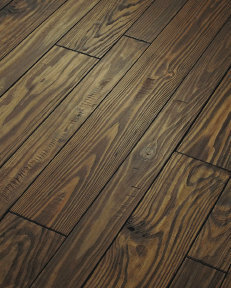 French Quarter also features a mix of 3 1/8 inch and 5 1/8 inch solid pine planks. Part of Anderson’s Virginia Vintage line, French Quarter features a warm color line of spicy red, golden honey-tone and a chocolate brown along with a subtle scrape, wire-brush finish. Columbia’s new Weston line is a collection of premium solid oak and hickory hardwood floors featuring weathered characteristics. The 3/4 inch matte finish planks are available in 2 1/4 inch, 3 1/4 inch and multi-width. Coswick Hardwood is set to launch a new line of European-style wood flooring at Surfaces with its Chevron collection. According to the company, the distinguishing characteristic of Chevron flooring is the 45 degree diagonal cut at the end of each plank that allows individual pieces to be laid in a zig-zag pattern. Coswick’s Chevron collection includes nine designer floors, manufactured from white oak, ash and American walnut, and is available in several surface finishes. Use of 2-layer tongue and groove engineered technology not only allows Coswick to manufacture a wider plank, but also ensures stability in a wide range of interiors, temperatures and climates. Hallmark Floors is introducing four new wood collections at Surfaces this year, and, according to the company, these introductions will give Hallmark twice the offering it had two years ago. TrueMark Glaze Tec Poly Finish is available on Hallmark’s new Moderno and Monterey Collections and offers hand-rubbed glazed looks that provide three times more durability than standard UV Aluminum Oxide finishes. The company’s new Moderno design concepts were driven by the demand for smooth contemporary colors and available in 6 inch wide with random widths to 7-foot long planks. 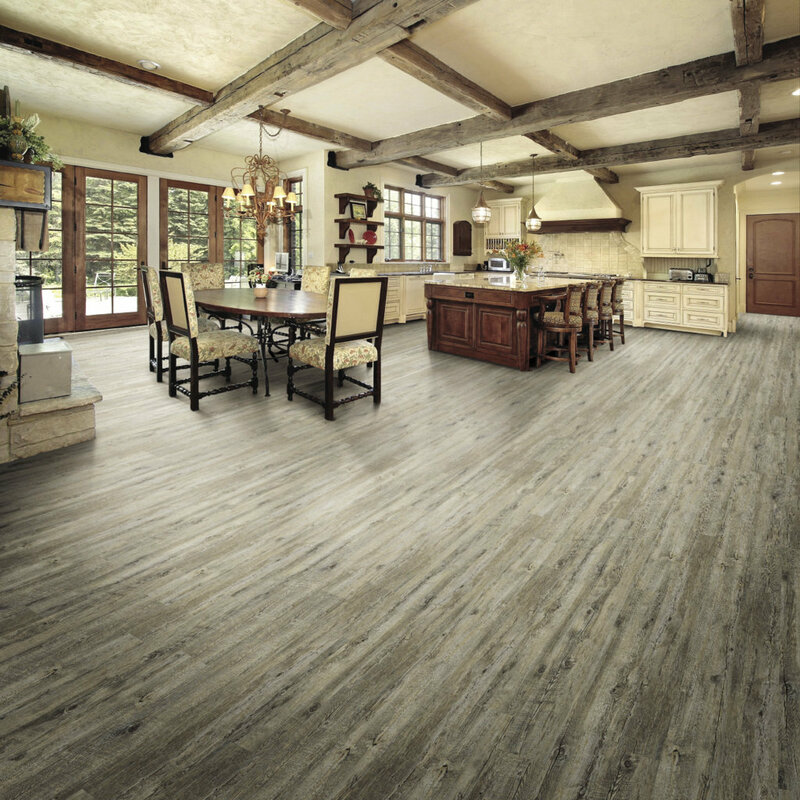 Customer demand for random width lead to the development of the Monterey Collection, said Hallmark, and this collection is available in maple and hickory with a combined width of 4 inch, 6 inch and 8 inch random length to 6-foot long planks. Using proprietary TrueSlice technology, Hallmark is producing a 2mm sliced face on a ½ inch total thickness engineered plank. 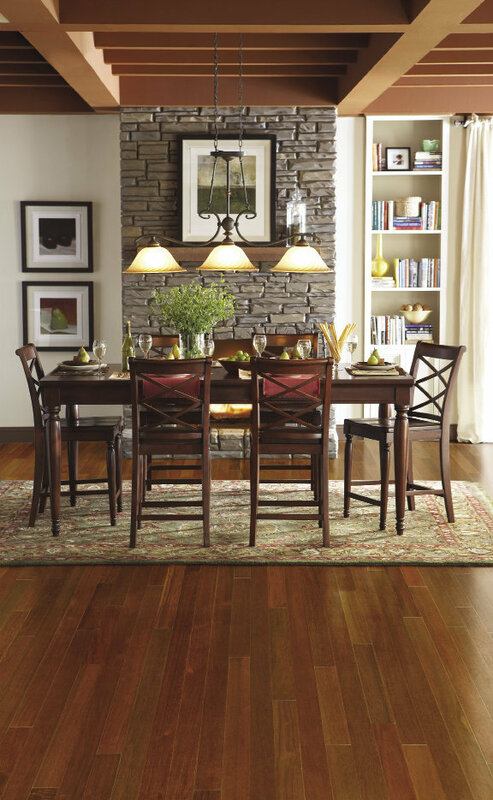 Hallmark Floors’ third introduction for 2014 is the Ventura Collection. Ventura features NuOil, Hallmark’s hybrid two stage oil finish system. Similar to Monterey, Ventura also features the company’s new TrueSlice technology to produce stunning visuals and very stable plank faces. Ventura is available in eight varying colors using French white oak with a light wire-brushed texture. Hallmark also introduced its new Organic Collection which creates a fusion of modern production techniques with those from antiquity, authentically replicating reclaimed visuals in both solid and engineered, with random widths and lengths. Hallmark’s new TrueMark Glaze Tec Poly finish offers hand-rubbed glazed looks. Home Legend will launch four new hardwood visuals available in three different constructions: HDF click-lock, engineered tongue and groove, and solid tongue and groove. The company’s new hardwood products are offered in handscraped finishes in three different species: acacia, birch and Brazilian cherry. HomerWood will be showing its HomerWood Premium Hardwood Collection at Surfaces this year. According to the company, this all-encompassing line includes traditional, smooth faced classics to texture rich, contemporary designs. HomerWood’s hardwood products are manufactured using wood sourced locally from the Appalachian mountain region. At Surfaces, IndusParquet is introducing long length wood planks to deliver a more linear design aesthetic with its new LongLengths profiles, the company announced. According to IndusParquet, unlike traditional hardwood flooring installed with planks 1 inch to 4 inches in length, it is now offering the longest hardwood flooring in the industry with planks up to 8 inches in length. IndusParquet’s LongLengths collection offers profiles with a variety of hardwood flooring planks in 7 inch to 8 inch lengths; the longer planks can be mixed in with shorter planks to create a customized look. This collection is available in a wide range of color profiles including the company’s new dolce pecan latte, Brazilian walnut, Brazilian teak, Tigerwood, Brazilian cherry, Brazilian ebony angelim and Brazilian chestnut. The line also comes in narrow to wide widths at 3 inch, 5 inch, 6 1/2 inch and 7 3/4 inch wide planks. IndusParquet also recently launched its Pau Ferro smooth engineered hardwood profile featuring bold striations in the wood’s natural grain. Pau Ferro features a multi-ply construction of 100 percent hardwood; the top layer is cut to highlight detailed grains and textures. The new profile is offered in extra-wide 6 ¼ inch planks for maximum grain exposure and random plank lengths of 11 inches to 88 inches. Both new product introductions, LongLengths and Pau Ferro, feature the company’s ClearVue finish for long lasting durability. Johnson Hardwood has introduced Pacific Coast series to add to its wide width plank offering. Named for the variety of colors and climates of the Pacific coastline, species include birch for its durability, maple due to its popularity amongst consumers and hickory for its rustic grain pattern and strength. The Pacific Coast series comes 6 1/2 inch wide and in random lengths up to 48 inches long with colors ranging from suede to copper and auburn to ebony. The birch and hickory products in this series are handscraped and hand-carved to enhance grain pattern designs. The maple products in this series have a smooth finish. Each plank goes through a dual hand-staining process to ensure even color tones. Johnson Hardwoods is also launching its English Pub series which consists of 7-foot long by 7 1/2-inches wide plank floors. The English Pub series is available in a wide variety of rich colors and includes both maple and hickory wood species, and is hand-sculpted. Kraus’ new premium hardwood floors, Touch of Euro, combines a modern color selection with functionality. Featuring tongue and groove installation, random lengths and the company’s PearlTouch finish, Touch of Euro is supported by Kraus’ 32 year warranty. Lauzon recently introduced Pure Genius to the North American market. Featured on all products in the Organik Series, Pure Genius smart hardwood flooring actually improves the indoor air quality of a home, according to the company. Activated by natural or artificial light, and by the movement of air, the high-quality intelligent flooring, which comes in a wide range of styles and finishes, continuously breaks down airborne toxins, creating a constant supply of pure air in the home. Pure Genius is specially-formulated using a patented titanium dioxide technology that decomposes bacteria, viruses and molds, and reduces potential carcinogens, by constantly transforming toxic airborne particles into harmless water and carbon dioxide molecules. Another new introduction by Lauzon is its Authentik series. The Authentik series features solid oak, wire-brushed hardwood flooring. The wire-brushed texture opens up the wood grain and gives the wood an authentic, two-toned look. Authentik comes with a matte finish and a smoky color palette that features shades from creamy white to rich earthy brown. 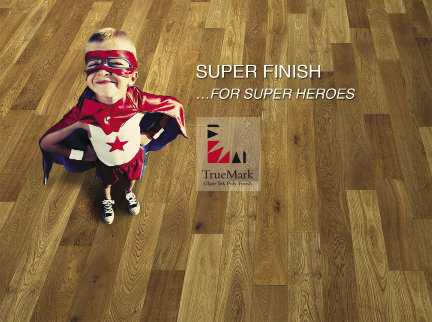 Maxwell Hardwood Floors recently launched its Specialty 2-10 Townsend Additions unfinished engineered wood floors. While the engineered collection has been in production since 2011, Maxwell is now offering the product in specialty 2-foot to 10-foot long planks, up to 7 inches wide. It is available in red oak, white oak, walnut, hickory, maple and American Cherry. 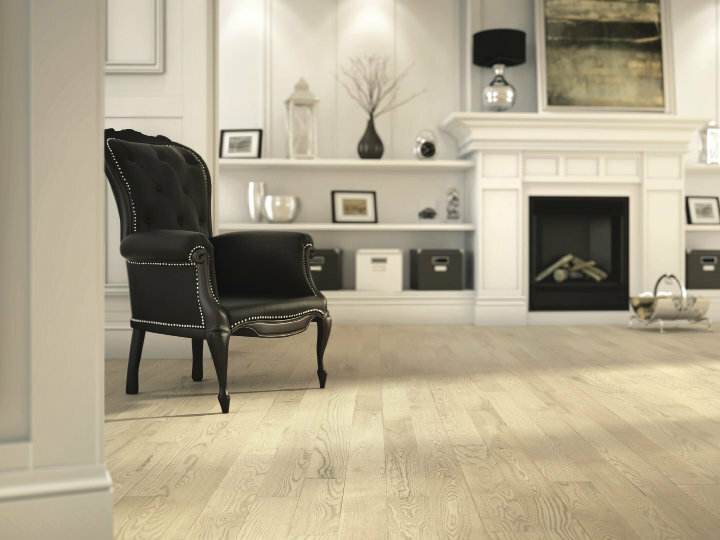 Mercier Wood Flooring is introducing a brand new oiled finish this year: Pure Expression. This finish, said Mercier, is maintenance-free and 10 times more resistant than traditional oiled finishes. Mercier’s Emotion Series is available in 12 colors which, according to Mercier, are close to the natural colors of the raw material and in 3/4 inch solid and 1/2 inch engineered construction. Mirage is expanding its product lineup this year to include new textured floors in its Imagine Collection, as well as new warm brown tones to its color palette and a new line called Hopscotch. Designed for active families and those who own pets, Mirage’s new textured floors are an addition to the Imagine Collection launched in 2013. These floors, which previously featured a cork look, now present an aged appearance and random distress marks that can more easily hide the smudges and scuffs of daily use. These new floors are available in three new colors: barn wood, a refined gray; tree bark, a medium-dark brown; and, seashell, a grayish, amber brown. These three colors are available in the company’s classic construction in 4 1/4 inch width on old red oak, and in engineered construction in 5 inch and 6 1/2 inch widths on old red oak and old hickory with the company’s Cashmere finish. Mirage’s newly introduced brown tone, Coffee, is available in a classic construction in 3 1/4 inch width on yellow birch, red oak and maple with semi-gloss or the company’s Cashmere finish. The flooring is available in an engineered construction in 5 inch and 6 1/2 inch widths on red oak and maple, and in lock technology in 4 5/16 inch width with semi-gloss or Cashmere finish. Mirage’s new line, Hopscotch, in the Sweet Memories Collection features a rich gray tone. The Sweet Memories series features a variable staining process that reproduces the look of old-fashioned floors. Hopscotch is available in the company’s classic construction in 3 1/4 inch and 4 1/4 inch widths on handcrafted red oak with the Cashmere finish, and in engineered construction in 5 inch and 6 1/2 inch widths on handcrafted white oak, rift and quarter sawn, and handcrafted red oak with Cashmere finish. At Surfaces this year, Nature will be showcasing its oak and Pacific Mohagany products. Nature’s lumber comes directly from sustainably managed forests in France and the United States. According to the company, Nature oversees the entire logging and production process to ensure that its white and red oak finished products are of the highest quality. Nature Flooring will also been showcasing its Pacific Mahogany product. Lumber used for its Pacific Mahogany product is hand selected from premium trees in the company’s own concession. Quick-Step has launched an entirely new hardwood program named Q-Wood. Q-Wood provides style, craftsmanship and livability through unique artisan hardwood floors designed with the latest trends in mind. Q-Wood floors are offered in a spectrum of colors, luxuriously finished and are available in three surfaces — smooth, soft-scraped and wire-brushed accentuated by soft-scraped tooling. 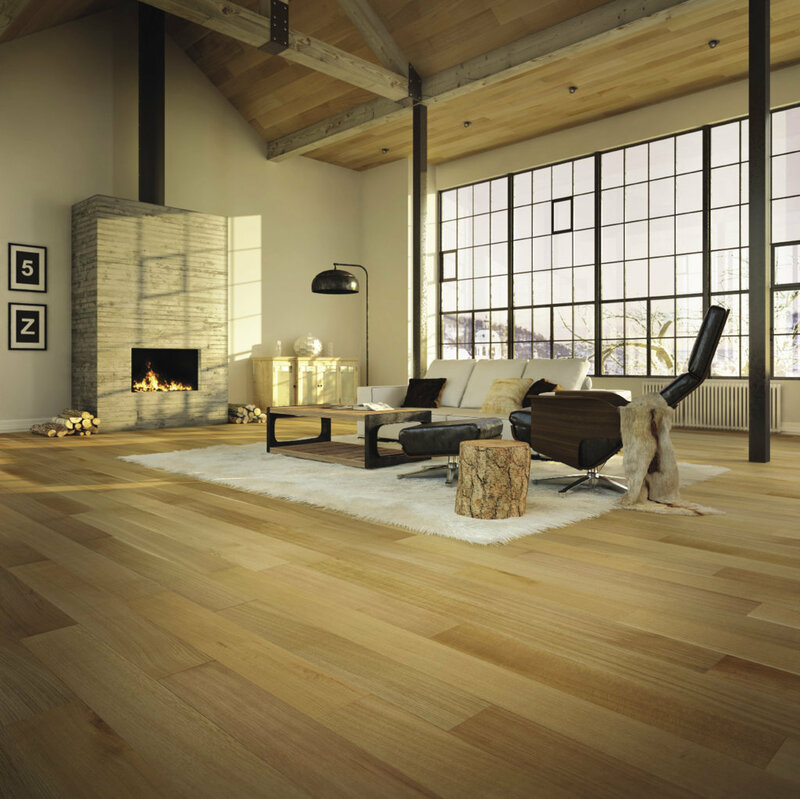 Made in the U.S.A., Q-Wood’s offering includes one walnut, two maple, three hickory and eight oak floors. A smooth surface is also available in Q-Wood. Q-Wood’s color palette boasts warm browns, weathered and earthy greys and muted blonde tones. Q-Wood also features the patented Uniclic glue-less installation locking system as well as the Opulux Performance Enhanced Finish, giving these hardwood floors a matte finish. Teragren has introduced its new Visions collection of wide plank Xcora flooring. With Visions, this premium Xcora flooring is combined with a resilient, high performance oil finish. The Visions line features a zero VOC, premium hard-wax oil finish for indoor air-quality, durability, simple maintenance and performance. Visions is constructed using Moso Bamboo and a 4-sided micro-bevel edge tongue and groove installation. Teragren has also recently introduced its Vantage II engineered wide-plank Xcora flooring with a high performance oil finish. Vantage II boasts the style of a high-performance oil finish paired with the beauty and durability of a strand bamboo wear layer over a eucalyptus plywood core. Vantage II features both smooth and wire-brushed texture options. USFloors recently introduced its Muse Strand, a new collection of engineered locking strand woven bamboo floors on HDF core. This new collection will make its debut in the fall and features 8 design crafted visuals in a 5” x 72” x 1/2” plank. Two additional new 2 1/2 inch strip products will add a vintage touch to this fashion forward collection. USFloors is also extending its line of Castle Combe Floor & Wall natural oil finished floors with Castle Combe Grande, featuring the industry’s biggest plank at 10 1/4” x 110” x 13/16”, according to the company. Urban Floor’s new 11 1/2 inch wide 7-foot long Composer Collection captures the look and feel of reclaimed hardwood floors. The brushed grain surface treatment features a mix of filled and unfilled knots, natural splits, mineral streaks and bowtie inlays. 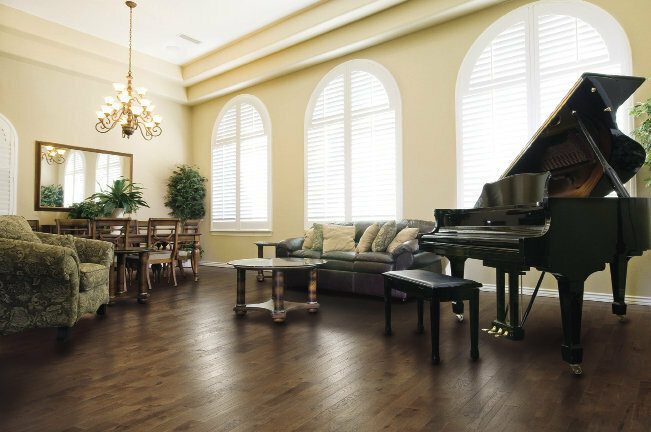 The Composer Orchestra is a 7 1/2 inch wide European oak flooring collection in three light, dark and grey colors. The special sandblasting and wire-brushing technique used in this collection, along with a world renowned German “Klumpp” oil finish, make this collection one of the most scratch resistant products in the market, according to the company. Wellmade announced the release of its character grade Old Growth Series of printed bamboo. Featuring Wellmade’s Clear-Tec bamboo imaging, dramatic visuals of American classics like old growth hickory and barn oak are brought to life with stunning accuracy. Wide planks and micro-beveled edges provides a realism that rivals hardwood, while the Moso bamboo core sounds and performs like hardwood and outperforms softer species like walnut and cherry, according to Wellmade. The Old Growth Series also features Wellmade’s commercially rated HardMax finish. This entry was posted in Industry News, Products by josephlundgrenconsulting. Bookmark the permalink.